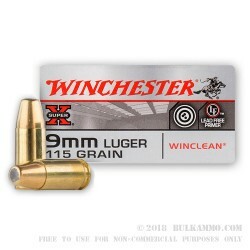 A very clean option for 9mm Luger shooters who prefer less exposure to lead and want less drama when cleaning their firearms, this WinClean Ammo is a great choice for practice rounds at the indoor range, or anywhere that the price point makes sense for you. 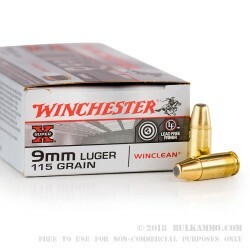 The Winclean is a combination of innovative processes designed to keep the shooting environment a bit healthier and your guns less prone to residue and fouling. 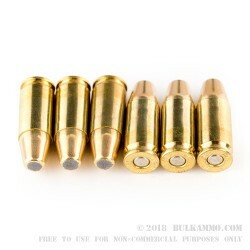 The jacketing on the bullet is essentially reversed in that the nose of the bullet is exposed rather than the base, which is completely clad in brass, which ensures that the hot burning powder does not come in contact with the lead of the projectile, meaning that the potential for lead residue being disperse through the heating process is lessened/eliminated. 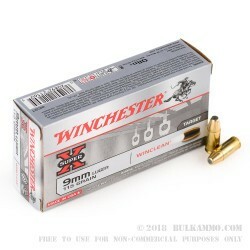 The hotter round burns more powder and gives a more complete burn, so your cases and the environment you are shooting in stay that much less smoky. There is little to no residue in the firearm as a result of powder being unburned, and the casings are easier to get clean for reloading. They are boxer primed Brass casings. 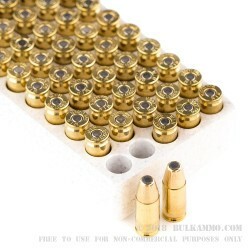 This ammunition is suitable for use in any 9mm firearm.